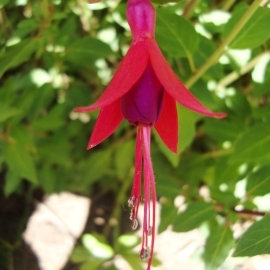 Hardy Fuchsia (Fuchsia magellanica) – Hardy Fuchsia Flower Essence aligns you with the resonance of the heart’s electromagnetic field transforming heart experience imprints that no longer serve you. It deepens your capacity to breathe in Universal Joy and breathe out your own heartfelt Joy to others. Reawakens “heartapathic” communication. I AM Universal Joy breathing through the “heartapathic” field of your heart chakra. Hardy Fuchsia is deciduous shrub that can reach up to 10 feet tall. Native to Southern Peru, Argentina and Chile, including the straits of Magellan (hence the species name), hardy fuchsia prefers moist soils and partial shade. Red and purple flowers hang from slender stems covered with deep green leaves from mid-spring to the first frosts and are a favorite food of hummingbirds visiting from South America during our spring and summer. The fruit of the hardy fuchsia is purple-black when ripe and is the shape of a .8 in (2 cm) long sausage. Fuchsia magellanica is one of the hardiest fuchsias, withstanding cold down to about 10-14°F (-10 to -12°C). Use Hardy Fuchsia Flower Essence when you energetically shut down your heart due to fear of being hurt. Protecting your heart by not engaging with other people. Or behaving immaturely in interactions and relationships as a way of separating yourself from other people. Helpful when sexuality is divorced from a loving heart. Hardy Fuchsia flower essence is also helpful when you desire greater connection with Joy and want to deepen your “intuitive knowing” from the heart. The heart is the body’s primary electromagnetic field producing oscillator. Within this heart-generated dynamic electromagnetic field, we live our lives. Healing can occur when we resonate with this field. Hardy Fuchsia Flower Essences aligns you with the resonance of the heart’s electromagnetic field. The imprint of heart experiences that no longer serve you transform into what you want to create in your life. A couple of examples. Resistance to opening up to other people gives way to playful vulnerability with appropriate boundaries. You are able to genuinely own your heart-centered sexuality and feel empowered. The way the hardy fuchsia bush grows - branches reach high while the flowers delicately hang down – imprints the Hardy Fuchsia Flower Essence with the energetic quality to connect you with your higher chakras while staying connected with the energies of the heart chakra. This creates “heartapathic communication” between these chakras. Hardy Fuchsia Flower Essence enhances your ability to connect with the electromagnetic communication pulses that resonate with the frequency of the heart chakra, connecting you to the hearts of everyone and everything, “heartapathic” communication. You are able to “know” in the same way that a migrating hummingbird “knows” where to fly by following the electromagnetic currents of its migration route. Hardy Fuchsia Flower Essence also deepens your capacity to breathe in Universal Joy, energetically metabolize it, and breathe out your own heartfelt Joy to others. This energetic metabolism of the heart is as vital to your over-all health as breathing oxygen. While the essence was being made, crystals of amber, amethyst, drusy quartz, blue phantom quartz, Himalayan quartz, heulandite, icosahedron cut quartz, Jeffrey quartz, kunzite, morganite, Nirvana quartz, Peruvian pink opal, pink sapphire, quartz points and rose quartz were placed among the plants with the storage (mother) bottles. The sun acts as a transformer to step down spiritual energies from higher dimensions. While the essence was being made, Amber acted as a lens to receive and focus sunlight for this purpose. Amber aligns the subtle bodies with the physical bodies, transmutes negative energy into positive energy, and emits a sunny and soothing energy that calms and enlivens the disposition. Amethyst brings peace and contentment. It enhances clear communication between your mental, physical and emotional bodies and between the physical and spiritual worlds, while translating those communications into daily activities. Blue phantom quartz (quartz with blue tourmaline inclusions) assists you to release the fear of reaching out to others and activates a desire to be of service especially in helping others realize the power of love. Drusy quartz help to energize and stabilize your subtle bodies. Himalayan quartz, double-terminated, bridges gaps in the energy fields and circuits to reminds us that it is important for energy to flow in both directions. Heulandite aligns the heart with the love frequency of creation. Resonate with the heart of the Earth and Universe to receive information that serves the higher consciousness purposes of the heart. Fosters compassionate, loving, joyful and blissful states of consciousness. Icosahedron cut quartz has 20 (5X4) equilateral sides. It is a bridge between the 5th Dimension - the entry into the unified Spiritual realms - and the 4 cardinal directions (N, S, E, W) on Earth. Jeffrey quartz provides strong amplification properties and long-distance healing abilities. Kunzite opens your heart to self-love and love for everyone and everything. Encourages you to listen and follow the silent intuitions and urgings of your heart. Releases stress and supports the parasympathetic nervous system. Morganite opens your heart to the level of Cosmic Love that is all around us. It strengthens the heart’s energy field and teaches protection through love instead of fear. Nirvana quartz teaches you that situations you experienced as stopping your growth were actually key in tempering your spirit. They helped your unique wisdom to be honed through life’s journey. Peruvian pink opal clears and calms the heart and brings a sense of peace and tranquility. Pink Sapphire opens your heart to the joy of interacting with kindness, forgiveness and love. Encourages vulnerability with appropriate boundaries. Rose quartz encourages gentleness, emotional healing, and uniting with the Divine; it shifts your body from a stress-based physiology to a higher frequency Love-based physiology. Quartz points open and clear all chakras and energy pathways, and clear and expand the energy fields. Quartz points and drusy quartz crystals defined the boundary of the energy field for making the Hardy Fuchsia Essence. The actions of the crystals inform the way this flower essence seats into the body/mind. The sounds of rattle and spirit song coming through Diana's voice were imprinted into the Hardy Fuchsia Flower Essence while it was being made. The protective and playful energy of hummingbirds feeding at the fuchsia bush was embedded into the essence.